The top English teams, one way or another, all qualified for the next stage of the Champions and Europa Leagues. However, United were the only team get a bad result from their last group stage march . Manchester City topped group F, five points clear of second-place Lyon after defeating Hoffenheim 2-1. LeRoy Sane scored both of their goals. The other English teams all finished their group in second place. Liverpool crucially defeated Napoli with a clean sheet, with a single goal from Salah, to qualify for the knockout stages. Napoli, who was leading group C, ended up finishing in third place and failed to qualify. Tottenham also achieved the impossible. They qualified after drawing 1-1 with Barcelona. This result was crucial as, like Liverpool, they finished on the same points and with the same goal difference as the team they were grappling with. Man United also managed to qualify, but less sensationally. They lost 2-1 against Valencia, with Jones netting an own goal for the opposition. Arsenal topped their Europa League group after defeating Qarabag 1-0 with a goal from Lacazette. Chelsea topped their group, seven points clear of second place after drawing with MOL Vidi. However, Morata woefully obtained a knee injury during the match. After an interesting start to the European competitions, it will be interesting to see just how far the English teams can go. Chelsea and Arsenal played their fourth group stage match on Thursday. They have been performing well in the Europa League and, by avoiding a defeat, they have now secured their entrance into the next stage of the competition. Chelsea defeated BATE Borisov 1-0 to top their group with two matches to go. Giroud’s goal in the 52nd minute allowed Chelsea to reach 12 points, six points clear of second place MOL Vidi in group L.
The Gunners are similarly topping their group after drawing 0-0 with Sporting Lisbon. The single point gained from the match was enough to secure their entry into the knockout stages of the Europa League, but their top spot in group E is not yet fully confirmed. During the match Welbeck sustained a serious injury and had to be taken off the pitch on a stretcher. It is fair to say that he will not be playing for a while. We can only hope for a speedy recovery. The London clubs are making good progress. With the next round confirmed, they can now focus on performing well in the Premier League. Most teams seem to have a trend that they have set for themselves and can not break. The results of the Champions League and Europa League matches proves this. Manchester City continue being the pride of Manchester after they defeated Shakhtar Donetsk 3-0. They are currently topping group F and, with the spectacular football they are playing, it does not look like they will be moving from that position. Mourinho, on the other hand, is still struggling to keep United afloat. His team lost 0-1 to Juventus after conceding a goal to Dybala. Perhaps the worse thing about it all was that it was Ronaldo, a former United legend, who assisted the goal. Tottenham also failed to win their Champions League match, drawing 2-2 with PSV Eindhoven. Spurs are 3rd in group B and only have 1 point. It is extremely unlikely that they will progress into the knockout stages. Instead, they will end up in Europa League, a competition in which the London clubs are excelling in. Having won their Premier League match against Leicester (3-1) to enter into the top four, Arsenal continued their winning spree. The Gunners remain top of group E after defeating Sporting 1-0, with a goal from Welbeck in the 77th minute. They have now won 11 games in a row in all competitons. Chelsea are also topping their group, and very comfortably at that. A hattrick from Loftus-Cheek secured their win against BATE Borisov. Generally, the teams doing well can not stop performing well; but those performing poorly seem stuck in a rut. Mourinho, without a doubt, is now a very frustrated manager. Once again, we have English teams that are struggling to compete in the Champions League. Apart from Manchester City, no other Premier League team managed to win their match. Manchester City came from behind to defeat Hoffenheim 2-1. Belfodil gave City’s opponents the lead in the very first minute of the match! However, the shock was dealt with well by Aguero who equalised for City in the 7th minute. Silva eventually managed to net the winner in the 87th. Unfortunately, Manchester United failed to do the same. They ended their game against Valencia with a goalless draw. United are still in the top two of group H, but such a result has served to increase the pressure on manager Mourinho. Liverpool almost managed to maintain a draw against Napoli, until they conceded a very late goal. Insigne netted a goal for Napoli in the 90th minute, allowing Liverpool’s opponents to steal all three points from the game! Unsurprisingly, Barcelona crushed Tottenham 4-2. Coutinho gave Barcelona the lead in only the second minute of the match. Despite goals from Kane and Lamela, the famous Messi was still netting goals for Barcelona up until the 90th minute. Spurs still have no points, and it is looking unlikely that they will progress to the next stage of the Champions League. If this becomes the case, they will be joining Arsenal and Chelsea in the Europa League. This might not be such a bad thing. Both the Gunners and the Blues have been performing well and are topping their groups. Chelsea defeated MOL Vidi 1-0 with a goal from Morata in the 70th minute; and Arsenal, using mostly academy players, defeated Qarabag 3-1! Incredible! Perhaps the Chanpions League is just too big a test for the Premier League teams. The Europa League, however, is definitely not. Both Arsenal and Chelsea won their first Europa League match of the season, against Vorskla Poltava and PAOK Salonika respectively. The Gunners won their match by scoring four goals and conceding only two. Aubameyang scored two out of the four goals, while Welbeck and Özil netted the rest. Chelsea, on the other hand, only used a single, early goal to claim their win. Willian netted the winning goal in the 7th minute of the match. Both London clubs have shown that they have the potential to go far in this competition. Whether that will affect how they perform in the Premier League as the football season intensifies is currently unknown. Manchester United’s experienced team defeated Ajax’s juniors to win the Europa League and, ultimately, qualify for the Champions League next season. The Reds defeated their opposition 2-0, the goal scorers being Pogba (18′) and Mkhitaryan (48′). Although Mourinho was too skeptical to celebrate the first goal, he definitely raised his hopes of lifting the cup by the time the second goal was netted. Manchester United might have finished 6th on the Premier League table, but all that is now irrelevant. They will be joining the top four Premier League finishers in the Champions League next season, and that is what they’ll truly be celebrating. Arsenal now remains the only top English Club to not be participating in the Champions League next season. How times have changed! Nevertheless, we wish all the English clubs the best next year. Who knows, just like United, the Gunners could gain success outside of the Premier League. The FA Cup Final will be played this weekend, and the only thing we know for sure is that one London club will be walking away with a trophy! All in all, congratulations Manchester United! Manchester United have really built themselves up since last year, and are beginning to show that they can still be a too club without Alex Ferguson. They put on very strong and promising performance in January. Not only were they largely winning their Premier League matches, but they also succeeded through the third and fourth round of the FA Cup. The same fate followed them throughout February, in which they reached the Europa League last 16 and won the Football League Cup by defeating Southampton 3-2! Impressive! It’s sad to note that they were knocked out of the FA Cup in March after being defeated by Chelsea 1-0. Manchester United are good, but perhaps not as good as the Premier League leaders. Although, that was indeed challenged this April. Manchester United defeated Chelsea 2-0 last weekend, just a few days after drawing against RSC Anderlecht 1-1 in the first leg of the Europa League quarter final! They won’t give up! Manchester United is currently 5th position on the Premier League table, but they have the mentality of a team in top four. Let’s hope that this can-do attitude helps them in the second leg of their Europa League match tomorrow! After Chelsea’s brilliant 3-1 victory against Manchester City, they continued their winning streak. Diego Costa netted the winning goal for Chelsea in their game against West Brom to secure their ninth successive league win. Chelsea are 3 points ahead of second-place Arsenal, and it seems like no team can stop them (especially with Diego Costa running around)! 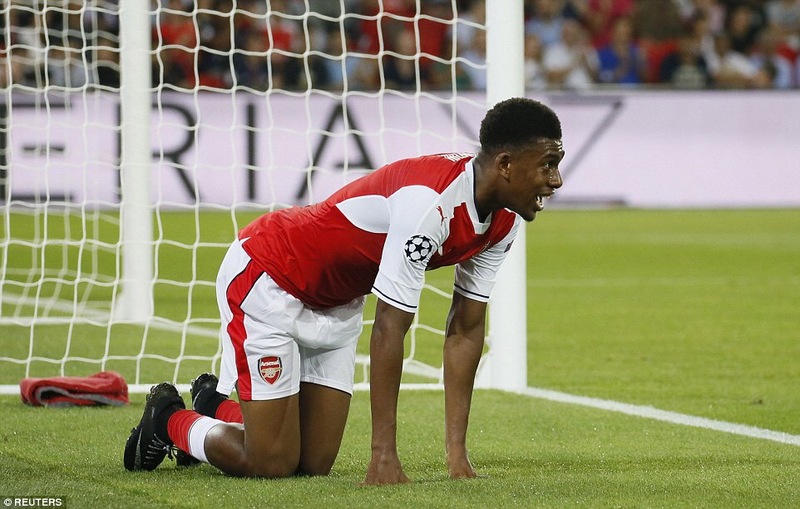 After defeating West Ham 5-1, Arsenal went on to destabilise FC Basel in the Champions League. They defeated the opposition 4-1, with a rewarding hat-trick from Pérez! Arsenal continued their celebrations into the weekend, as they defeated Stoke 3-1. This secured their second place position on the Premier League table, keeping them in touching distance of the leaders, Chelsea. After losing to Bournemouth 4-3 and then drawing 2-2 with West Ham, Liverpool have fallen to third place, six points behind the leaders Chelsea. With the way the Blues are playing, it might prove too difficult to close the gap again. Manchester City have also had their fair share of disappointments. During their match against Chelsea, the Man City players lashed out at the blue players out of frustration, causing Aguero and Fernandinho to be suspended for a few matches. This perhaps gives reason as to why City drew 1-1 with Celtic in the Champions League, and lost 4-2 against Leicester City. They are currently sitting fourth on the Premier League table, but with the same 30 points as Liverpool. Their title hopes aren’t over yet, but only if they find a way to recover from their distress. Now, moving down to sixth place, we find Manchester United. It’s been a tough season for them so far, but they seem to be trying to turn things around. After drawing 1-1 with Everton, they defeated Zorya Luhansk in the Europa league and Tottenham 1-0 in the Premier League. That’s more like it. However, we must still be aware of the fact that they’ve still got a lot to make up for. United are six points away from top four and a whopping 13 points behind Chelsea. The Premier League is a long road, and they must continue to prove themselves constantly. The Premier League top teams are breaking up point by point. They all seem to have progressed in Europe, despite a few recent poor results. However, the Premier League is proving to be a whole different ball game! Manchester City began the week on a high after defeating Barcelona 3-1! However, by this weekend they had been brought down a notch. Luckily, the opposite was true for Manchester United. Messi gave Barcelona the lead against Manchester City in the 21st minute. However, three goals from Gundogan (39′, 74′) and De Bruyne (51) silenced the team known as the best in the world! Perhaps it was the energy needed to secure this win that caused City to underperform in their match against Middlesbrough. Although Aguero managed to net a goal for his team in the 43rd minute, de Roon scored the equaliser for the opposition in extra time. By this point, it was too late to make amends. Manchester United did the reverse of what Manchester City did. The Reds lost their Europa League match against Fenerbahce 2-1. They began losing from the second minute of the match, and Rooney’s late goal in the 89th minute couldn’t save them from defeat. Fortunately, United had a better fate this weekend. They defeated Swansea City by only conceding one goal and by netting three. That’s more like it! Manchester City are one win away from securing their entry into the next round of the Champions League. However, they are down to third place on the Premier League table. Manchester United still have a chance to reach the next stage of the Europa League, however, they are going to have to perform a lot better in order to do so. Despite this, they seem to be on the up as they are now sixth place on the Premier League table. Nothing is ever clear cut in football. As more games are played, the clearer things will become. Soon it will be evident which teams are strong and which ones are not. Arsenal had a shocking blow in the Champions League match this week, similarly to Manchester United in their Europa League game. The only different between the two teams was that Arsenal managed to recover. It’s sad that the same can’t be said about Mourinho’s team. Paris St Germain wasted only but a few seconds before taking the lead against Arsenal. Cavani gave PSG an extremely early lead when he netted a goal just after 42 seconds! Well, there’s no time like the present! The Gunners did eventually manage to equalise in the 77th minute (thanks to Sanchez), however, this wasn’t even the most exciting part of the game. In extra time, when the result had pretty much been confirmed, both Verratti (from PSG) and Giroud were sent off the pitch. All they had to do was hang in there a little longer. Pity. Nevertheless, the great news is that all the teams in Arsenal’s group drew and, so, every team in group A has one point. Therefore, the Gunners still have a clean slate and an equal chance of progressing to the next stage! Tottenham, sadly, were the only England team to lose as they conceded two goals to Monaco which they failed to cancel out. But honestly, Spurs weren’t the only English club in dismay. In Europa League, the great Manchester United fell under the petite power of Feyenoord. It only took one goal, from Vilhena in the 79th minute, to punish Mourinho’s team. The Reds are going to have to work a lot harder if they want to succeed in Europe.